Only three months have passed since the triumph of the conservative government in Spain. The economic crisis and labor reform have been key themes in the national and international press, with headlines about debt, the climbing unemployment rate (the highest in Europe) and the charges of corruption levied against businessmen and members of the government. Immigration policy, in the meantime, has been forgotten. Far behind us are the days when we would wake up to reports of undocumented immigrants jumping the barriers cordoning off Morocco from Ceuta and Melilla—two of the most heavily trafficked crossover points between Europe and Subsaharan Africa—or of makeshift boats washing up on the coast of Andalucía or the beaches of the Canary Islands. Yesterday, Periodismohumano broke the news of the fifty-four men and women deported this past Friday from Madrid to the Democratic Republic of Congo. After three years of struggle, hunger strikes, and protests, forty-three men and women were transferred from the CETI (a temporary processing center for immigrants) in Melilla to the CIE (the immigrants’ detention center) in Algeciras and finally to Aluche, the CEI in Madrid. It sounds like a dream come true: arrival on the Peninsula, with the hope of living freely in a country whose regulations prohibit random deportation to their country of origin. Their companions from the CETI in Melilla were therefore shocked to receive a call stating that these men and women, as well as eleven already interned in Madrid, had been carted to Barajas airport in handcuffs, where five of them were beaten for refusing to enter the airplane that would leave them, hours later, at the dreaded Kinshasa Penitentiary and Reeducation center, recognized as one of the region’s most dreadful hellholes. -More information on the case can be found in Blasco de Avellaneda’s article in the Melillan daily El Telegrama-. This is the most flagrant stain on Spain’s immigration policy since the murder of several people who tried to jump the fence between Melilla and Morocco in 2005. Less than a week after the March 4 protest in Madrid held by SOS Racismo and other organizations advocating for the closure of Spain’s immigrant detention centers, Rajoy’s government has begun taking concrete measures against the country’s immigrants. For years, the opaque CEI’s have been cited by numerous national and international groups as well as by the country’s official ombudsman for mistreatment of inmates, infringement of liberty and unsanitary conditions. 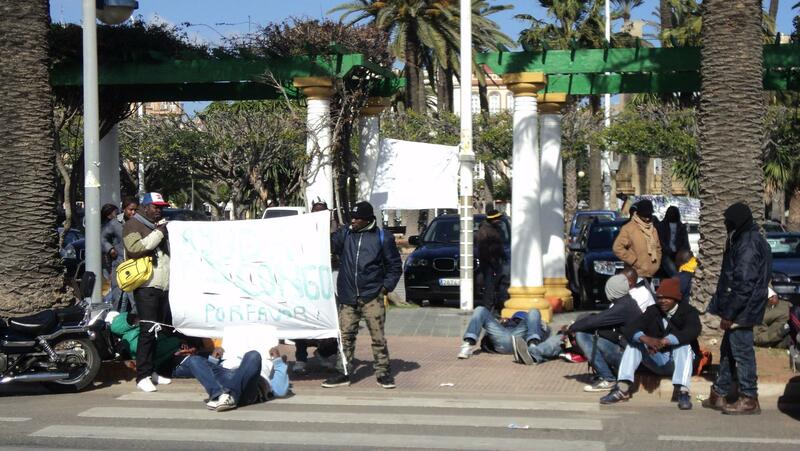 After the deaths last Christmas of the Congolese immigrant Samba Martine in Aluche and of the Guinean Ibrahim Cissé in the CIE in Barcelona, Spain has become a lightning rod for the debate on the status of immigrants arriving from Europe’s southern borders. -More information about the March 4 protest in Madrid can be found in this article in Madridiario-. *You can also read this article in the blog Africa Is A Country. Esta entrada fue publicada en marzo 18, 2012 por beatrizlealriesco en ENGLISH, journalism y etiquetada con africa, africaisacountry, spain.